This station has been designed to be used as a work area and to display information. It has been fabricated from 25mm x 25mm box section and 1.2mm cold rolled sheet. It features a drawer fitted with ball bearing slides and storage shelves for A4 files. To manoeuvre the station, 4 off 100mm diameter swivel and braked castors have been fitted. The station features a rear up stand fitted with a printed sheet metal wipe board measuring 1070 (W) x 900mm (H). There is a section at the back of the main work area and one on each side of it measuring 900mm (H) x 600mm (W). The station has been built to allow for 5’s boards to be retrofitted at a later date. 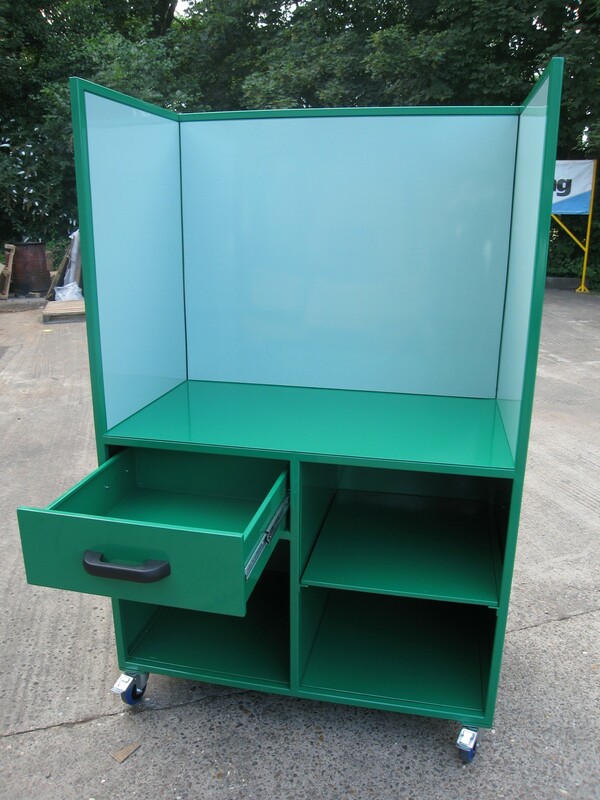 The workstation has been powder coat finished in RAL 6029. The magnetic white boards have been finished in RAL 6019 with protective laminate. Approximate overall size 1120mm (W) x 1800mm (H) x 650 (D) work surface height 900mm.